In the wake of a contentious U.S. presidential election cycle, researchers and educators are shining a spotlight on critical “information literacy” skills. Determining authority, accuracy, and bias have long been essential aspects of analyzing content and sources of information. Today, this is no easy task for students (and adults as well) when authors of “information” do their best to deceive readers or hide their identity behind domains, such as .org, factual-seeming but phony statistical data, and authoritative-sounding language based on “pants of fire” lies. In her 2014 book, It’s Complicated: The Social Lives of Networked Teens, researcher danah boyd wrote, “becoming literate in a networked age requires hard work, regardless of age” (177). While the amount of fake “news” has increased exponentially, the problem of determining authority and validity in information sources has been a critical skill since the early days of the Internet. Researchers at Stanford University recently conducted and released the results of a 2015-2016 study, “Evaluating Information: The Cornerstone of Civic Online Reasoning.” The study showed what school and academic librarians have known through their own observations and action research related to middle, high school, and college-level students’ information literacy proficiency: “Young people’s ability to reason about the information on the Internet can be summed up in one word: bleak” (4). Some who entered the conversation wondered if librarians should be engaged in “politics.” For me the answer is clear. Literacy is “political” because it empowers people. From my perspective, school librarians are required to teach youth to determine the authority and accuracy of information and we are charged with coteaching with classroom teachers to ensure that students are information literate. 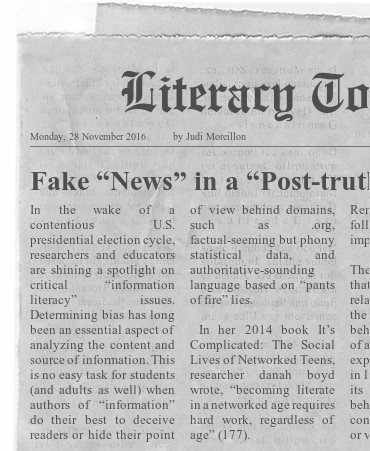 Taken together, “fake news” in a “post-truth” world create an even greater need for the information literacy expertise of school librarians. Information is supposed to be factual, whether or not it is considered “news.” (Even in the halcyon days when people read printed newspapers, reporters and editors frequently rushed to “get ahead of the story” and published “errors” that later had to be corrected.) When school librarians bring their expertise to the collaboration table, they can coteach with classroom teachers to help students develop critical literacy skills that are even more essential in the online information environment. Like all educators, school librarians must continually self-assess and develop our skills. But we have a strong information literacy foundation on which to build and the desire and responsibility to share our expertise with students, colleagues, and community. 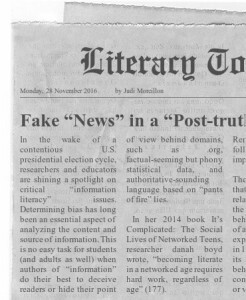 Fake “news” and a “post-truth” world call all school librarians to step up and lead. boyd, dana. It’s Complicated: The Social Lives of Networked Teens. New Haven, CT: Yale University Press, 2014. Every night for the past year, I have been recording my “gratitudes” in a journal. I began this reflective and hope-building practice after I learned that Texas Woman’s University rejected my proposal to continue in my associate professor position as a telecommuter from Tucson. (After seven years, commuting for my marriage was no longer emotionally or financially sustainable.) These daily notes to myself capture my thoughts as I negotiate this transition time in my life. This reflective practice provides me with reminders of my many blessings. I am grateful for the many friends and colleagues I have met and worked with throughout my school librarianship career. There are simply too many of you to name. As a member of the American Library Association (ALA), American Association for School Librarians (AASL), Association for Library Services to Children (ALSC), Arizona Library Association (AzLA) and Teacher Librarian Division (TLD), Texas Library Association (TLA) and Texas Association of School Librarians (TASL), I have had the opportunity to get to know and learn with outstanding librarian practitioners, researchers, and literacy advocates. While I have been a member and have been periodically active in education associations, my commitment to (school) librarianship has been and continues to be the overarching theme of my professional work. I am grateful for the people who lead and participate in library organizations. We share a set of core beliefs that come from our hearts and reach out as we serve children, youth, and our communities. I am blessed to be in their company; I am honored to call so many colleagues friends. 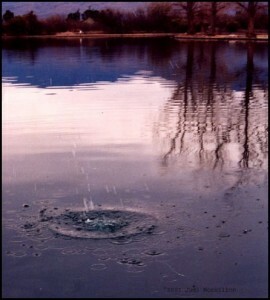 The photograph above was taken in 1998 at the 3M corporate compound at Wonewok in Minnesota. At the time, I was serving on the AASL @yourlibrary® Task Force. Those of us who participated enjoyed three days of thinking, planning, and playing that, for many of us, solidified our commitment to advocating for the professional work of school librarians. Like many of my Wonewok colleagues, I felt “under the spell” of the Northern Lights and the incredible beauty of the grounds at Wonewok. In the above photograph, a number of us posed where the Northern (Continental) Divide intersects the St. Lawrence Divide near Hibbing, Minnesota, with waters draining to the Arctic Ocean, the Gulf of Mexico, and the Great Lakes. I believe the school librarian profession is at another one of those watershed times in our history. In the federal education legislation called the Every Student Succeeds Act (ESSA), school librarians are included as key faculty in educating students for the future and collaborating with classroom teachers to co-create dynamic learning spaces and opportunities for all members of our learning communities. Thank you especially to the ALA Washington Office Executive Director Emily Sheketoff for her tireless and unwavering advocacy efforts on behalf of school librarians. And thank you to AASL and our dedicated members who have provided 30 (!) state-level ESSA trainings in the past 60 days. Whew! You are a wonder. Thank you to all of our colleagues for offering our expertise and care to children and educators through our professional work. As we move forward together, and to show my gratitude, I recommit myself to our mission to provide each and every student in the U.S. with a full-time state-certified school library professional who serves her/his school community as a leader, instructional partner, information specialist, teacher, and program administrator. 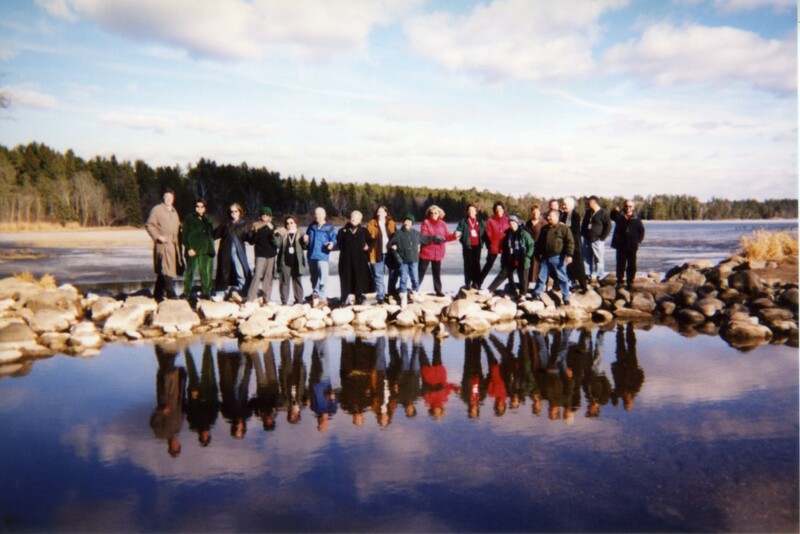 Some of those pictured: Connie Champlin, Susan Ballard, Terri Grief, Harvey, Barbara Jeffus, Doug Johnson, Carrie Kienzel, Keith Curry Lance, Deb Levitov, Eileen Schroeder, Rocco Staino, Barbara Stripling, Hilda Weisburg, Terry Young, yours truly, and ??? This post is a continuation of last week’s reflection on my take-aways from the 2016 Arizona Library Association Conference. I hope BACC readers who were at the conference will comment on their learning, including adding reflections on sessions I was unable to attend. 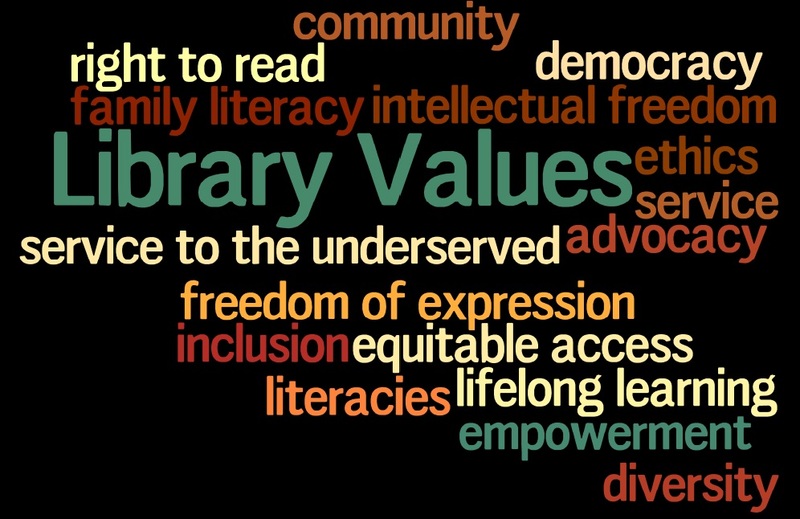 One of the reoccurring connections for me on the second day of the conference Friday, November 4th, was the importance of library values. 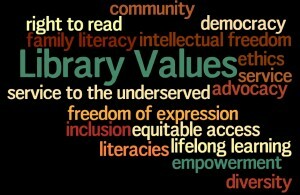 This word cloud captures just some of the values embedded in the competencies for librarians as codified by our professional organizations: the American Library Association Core Competences, Association for Library Service to Children’s Competencies for Librarians Serving Children in Public Libraries, ALA/AASL Standards for the Initial Preparation of School Librarians, and the Young Adult Library Services Association Competencies for Librarians Serving Youth: Young Adults Deserve the Best. Jessica Jupitus and Lori Easterwood provided the “Libraries Transform, But How?” opening keynote on Friday, November 4th. When Jessica and Lori worked together a four-year goal of the Sacramento (CA) Public Library’s strategic plan was to increase positive public awareness about library services and increase participation in library programming. At the time, Jessica and Lori were young adults themselves. They used deliberately provocative titles, such as Punk Rock Aerobics and Heavy Metal Yoga, to attract 18 to 28-year-olds to programs. For me, their program connected to the library values of inclusion and diversity. In my presentation “Storytelling Matters: Reach Out with Digital Advocacy Stories,” I invited participants to reflect on their library values and connect their values with a program or service and an audience they would like to bring into the library. Participants used a graphic organizer to develop a meme, one-sentence theme, think about the needs of their target audience, and identify some free or low-cost Web 2.0 tools to create their stories. On the resource page for the presentation, I shared examples of school and public library digital promotions. After the session, I added an example that participant Claudine Randazzo shared with the group. The testimonials in the video on behalf of the Coconino County bookmobile tell the story of this service so well! As always, I was inspired by the values in action of those who received awards at the AzLA service and author awards luncheon. Congratulations to TLD’s own Patty Jimenez for her Follett School Librarian of the Year Award. I believe that at least one award recipient embodied each of the values in the word cloud above. Sunnyside Unified School District (SUSD) librarians Kate Street, Jennifer Flores, and Fran Stoler presented “Extreme Library Makeover: Making Spaces for Student Creation and Collaboration.” They shared their journey in “creating a digital age library in a 1970s space.” Their Web page includes a timeline, floor plan (for Sunnyside High School), movable furniture, and flexible spaces. For me, their “Extreme Makeover” work connects with the library values of freedom of expression, empowerment, and literacies. Some of the renovations included smart tables, mobile whiteboards, kiosks, “Nemo Trellis” (new to me) and more. Kate, who is the librarian at Sunnyside High School, reported that the library’s new sound studio has been the most successful aspect of their renovation in terms of student creativity and ownership. Fran, who is the Desert View High School librarian, noted that the positive attitude of the librarians, students, teachers, and administrators was as important in their renovation efforts as were the renovations themselves. As noted in last week’s post, Sunnyside is a 1:1 technology district and students are eager to spend time away from screens! Jennifer, who is the librarian at Los Amigos (Elementary) Tech Academy, shared some low-cost, low-tech strategies for library renovation, including painting walls and tables with whiteboard paint, board games, and freshly painted walls. Los Amigos uses a 50/50 model with students engaged with tech 50% of the time and interacting face to face (f2f) 50% of the time. Jennifer’s goal is to increase community involvement during the f2f time — to bring in the funds of knowledge in the community to mentor and teach the students. As Miguel Figueroa noted, for librarians, a societal trend is simply “trendy” unless we view it through the lens of our library values. If we examine the signals in society that confirm a trend exists, we should then explore that trend to see if it aligns with our library values. When it does, librarians can work together to create library services and programs that will meet the current and future needs of our communities. Thoughtful librarians can take action to develop innovations that matter. Every professional learning experience provides opportunities to meet new colleagues and to get to know long-time colleagues better. At the TLD Mixer on Thursday night, I enjoyed the conversation with Jean Kilker, Patty Jimenez, Cindy Reyes, and Leslie Preddy. It was rewarding to connect with former University of Arizona graduate students and know they are doing great work in libraries across the state. I left the conference hopeful for the future of librarianship. I know there is no shortage of work to ensure that our libraries continue to work with our community members to improve lives. I also know we can do it. Yes, we can! Last Thursday and Friday I attended the annual Arizona Library Association Conference. This year it was held in Tucson at a hotel in the shadow of the beautiful Santa Catalina Mountains. As reflection is an important (and some would say essential) aspect of learning, I am taking this opportunity to share my take-aways from the conference sessions I attended. At the Teacher Library Division (TLD) meeting, Leslie Preddy, the immediate past-president of AASL, shared the many ways our national organization supports our profession. Leslie pointed us to the AASL toolkits, including the most recent “Resource Guide for Underserved Student Populations.” She noted sample posts from the fresh and vibrant Knowledge Quest blog and reminded us that school librarians can sign up to have announcements of new blog posts pushed to our email inboxes. Leslie also reminded us that AASL has been providing leadership and professional learning for school librarians for 65 years! You can donate to the 65th Anniversary Campaign and you can add a Twibbon to your social media profile photo(s). I hope you will join me in supporting and promoting this campaign. After Leslie’s presentation, several of us talked about school librarians and the Every Student Succeeds Act (ESSA). We wondered how the TLD might maximize the benefit of an AASL-facilitated workshop. As Arizona educators, we should be part of the state’s ESSA plan and position our work as essential to preparing future ready students and supporting classroom teachers’ teaching. After lunch, I attended a session by Dan Messer called “Transforming Your Perspective: The Beauty of Generalists in Library Technology.” Dan’s own experience as a creative, innovative generalist connected with my perspective on the potential of school librarians to contribute broadly in their learning communities. School librarians may know a great deal about teaching information literacy or guiding inquiry learning but we have to know a little about many things in order to manage our libraries and effectively coteach across the grade levels and disciplines. (In 2010, when the AASL Board officially dropped the “school library media specialist” term, I venture to say that no one was happier than I was!) Check out Dan’s blog “Cyberpunk Librarian” blog. At the end of the first day of the conference, I participated in a hands-on, minds-on workshop with Mr. Figueroa: “From Futuring to Innovation.” I was fortunate to have the opportunity to think with three Sunnyside Unified School District (SUSD) school librarians (see next week’s post) and a college-level librarian from the University of Phoenix. Our task was to explore societal trends through the lens of library values and develop an event/program that would reflect that trend and our library values, and appeal to patrons. Next week, I will share more thoughts on Mr. Figueroa’s suggestion that we “push on trends with our #library values” and reflections on the second day of the conference. Side note: I tweeted at #AzLA2016 throughout the conference. Tweeting is one way I document my learning during a professional development opportunity. Reviewing my tweets supported my reflection as well.